Metal drop ceilings are suspended ceilings that are made from square panels that are supported by a metal grid system. This grid system is suspended from a higher ceiling that is usually made from other materials such as wood or masonry. Tie wires are then used to anchor the ceiling to the more permanent ceiling in order to maintain the metal drop ceiling, so it stays at an appropriate height. Simply put, metal drop ceilings are just ceilings that are installed below the original ceiling. 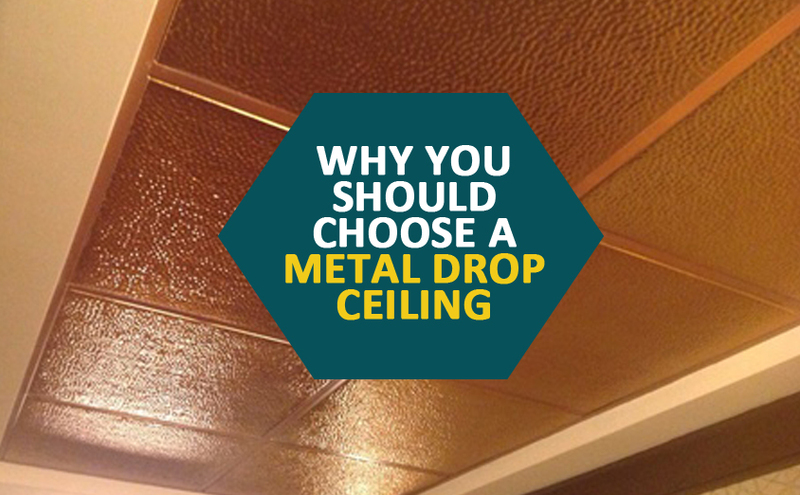 So, why should you choose a metal drop ceiling over more traditional ceiling types like fiberglass and vinyl? Well, we have the answer to that question and some other information you may find helpful for your next renovation. Metal drop ceilings over traditional ceilings offer a much more economical choice which is good if you are working with a smaller and tighter renovation budget. This type of ceiling does not require a lot of additional and extensive work to install, and you will not have to demolish or rebuild anything in the process. They are incredibly easy to install and just as easy to remove which keeps the overall costs of installing a metal drop ceiling affordable when compared to all the extra costs you would find with other ceiling types. With metal drop ceilings, you also have a wide variety of materials and colors you can choose from for your next renovation. So, while these ceilings are highly functional, they can also be very aesthetic and can match your personal style and tastes. Additionally, you will also have access to an assortment of different lighting options for your metal drop ceiling as well, so the possibilities are endless. Another big advantage of installing a metal drop ceiling over a more traditional ceiling is how moisture resistant and hygienic they can be. Since they are moisture resistant, it also makes this ceiling a more than a suitable choice for areas in which there is a lot of water or moisture such as swimming pool areas, hospitals, and factories. In addition to its moisture resistant properties, you will also find that metal drop ceilings also offer fire protection and heat insulation. They are also a very green alternative to the traditional ceiling types with the added fire safety and security on top of its other benefits. Soundproofing is also another important aspect some owners may look to have when completing their renovations. Metal drop ceilings offer sound dampening and can help keep out the noise from the other levels in the building. This will make for a much quieter and more professional environment that is also a lot easier to work in. As already mentioned, metal drop ceilings are relatively easy to install when compared to drywall ceilings. Drywall ceilings require an extensive amount of additional work and each drywall sheet typically weighs in at around sixty pounds each. Therefore, it will require more than one person for a successful installation. Metal drop ceilings can be a great DIY home renovation project and can be completed easily over just one weekend. Vinyl and fiberglass ceilings are other options people may gravitate toward for their home renovation, but it is important to keep in mind that fiberglass, for example, can’t really be painted so you are limited when it comes to design options to choose from for the space. They also don’t have as much charm and personality as metal drop ceilings and again, are costlier and more time-consuming. Finally, when it comes time to decorate, drywall will leave you wishing you had a bit more style and personality. Drywall is plain, bland, boring, and not as aesthetically pleasing as other materials. Metal drop ceilings have so many different colors, styles, finishes, and designs to choose from and each can add texture, style, and even depth to the space. Since the colors are also immense, you can easily match and complement your already existing décor as well, and you will only really be limited by your own imagination. So, next time you are considering a home renovation, you should take a closer look at the advantages you will find with metal ceiling tiles over the traditional ceiling types often used. You will not be disappointed.